Pelican Water Systems, producers of high-quality and affordable water filtration systems, announces sale pricing on the popular 6-stage Reverse Osmosis Water Filtration Systems. The systems, which reduces up to 98% of lead from drinking water, can provide access to safe water to residents of Michigan during the current water crisis. President Barack Obama declares state of emergency in Flint, Michigan, as hundreds of thousands remain without access to safe drinking water. The Michigan House approved the $28 million dollars in aid funds requested by Governor Rick Snyder following President Obama’s declaration. Despite the influx of funds, Gov. Snyder estimates the deteriorated water system could cost upward of $767 million dollars to repair, if it is even a possibility. Politicians have also brought forward legislation that, if approved, could send up to 600 million dollars to the city to repair the aging infrastructure and treat those exposed to lead in their drinking water. Pelican Water Systems, producers of high-quality and affordable water filtration systems, is responding to the situation by offering their 6-Stage Reverse Osmosis water filtration system at a discounted price in an effort to help residents gain access to safe water. The filtration systems remove up to 98% of lead from water. Pelican systems are NSF-certified and also filter 96% of fluoride and 97% of arsenic out of tap water sources. Offering up to a year of purified drinking water through the use of additional filters, Pelican Water Systems provide some of best longevity for water filters on the market today. Systems are designed to fit compactly under counter and are able to be simply and quickly installed by anyone. Many believe the lead crisis was prompted by a money saving measure to find cost savings through less expensive water resources instituted by a state appointed emergency-manager in 2011. At that time, the water supply began to be drawn from the Flint River, which is extremely corrosive since older water lines through the city contain lead. The result was caustic waste leaching off of the pipes and into homes. While the water could have been treated with an anti-corrosive agent, it was not. Residents began consuming water laced with dangerously high lead levels for an extended period of time. First reported in January of 2015, ongoing testing have detected levels as high as 397 parts per billion in some homes. While the Environmental Protection Agency (EPA) notes that there is no level at which lead in the water is safe, they generally only get involved when lead levels reach 15 parts per billion or greater. City officials urged residents to stop consuming city water in October of 2015 following the detection of high levels of lead detected in children’s blood samples. Residents were also advised not to use unfiltered water for cooking or bathing. 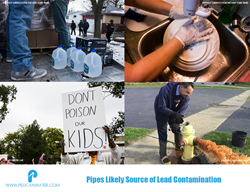 The consumption of lead through water can have serious and long-term health implications including damage to the nervous system, stunted growth in children, and the development of some learning and behavior disabilities. In adults, prolonged exposure can cause high blood pressure and problems in the kidneys. While funds are now funneling into the impoverished city, a long-lasting remedy to the tainted water supply may still be many months away from realization. A proposed action plan is not expected until mid-April, and even then real results could be months away. PelicanWater.com is the official, factory-direct retail website for Pelican Water Systems, providing professional knowledge and leading technologies in whole house water filtration, countertop water filtration systems, UV bacteria disinfection systems, as well as salt-free water softening and conditioning systems. Pelican Water products use cutting-edge technology and enable customers to go green by eliminating wasteful and harmful salt brine discharge that is polluting our valuable fresh water resources. For over a decade, Pelican Water has stayed true to their mission statement: being a company that helps families enjoy cleaner, safer, better-tasting water in their homes in an environmentally-friendly way. Pelican Water has been and continues to be the global market leader in salt-free water softening system. For more information about Pelican Water Systems, visit PelicanWater.com.